The year is flying by fast. Easter is here, Passover is here, and as every year, B&H Photo will be closing for the holiday. 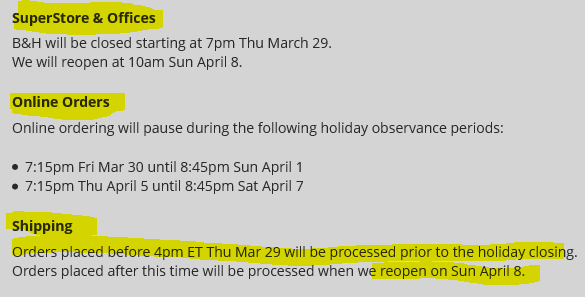 If you need something from B&H now, the order cut-off point is Thursday 3/29/18 at 4pm eastern. Orders placed after that deadline will be processed when B&H Photo re-opens on Sunday April 8 in 2018.